Carlos Monroy is our Production Manager. Carlos just recently joined the team. 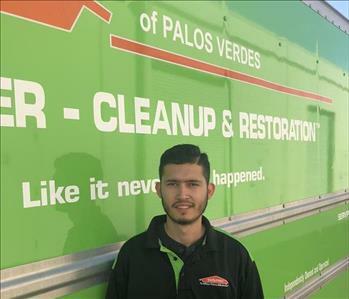 He has gone through rigorous training to become IICRC Certified in WRT, ASD, Fire and Smoke, Carpet Cleaning, Confined Space Training, 8 hour OSHA Safety Training, and Odor Control. He has taken many courses to ensure his continuing education in the water/fire/mold clean up industry. His hobbies are spending time with his wife, kids, and family and watching his favorite sport teams. Scott is our Marketing Manager. With 5 years Restoration experience, Scott’s industry knowledge shows in the quality care he provides every day to our clients…and the customer compliments and appreciative comments support this! 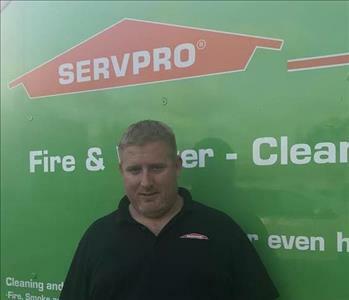 Scott is IICRC Certified and constantly goes above and beyond expectations to benefit our SERVPRO Team and those affected by emergencies. In his leisure time, you can find Scott spending time with his girlfriend, dogs and family.